Last night's 2015 HSE Graduation was without question, a memorable evening! Inspirational, emotional and moving in so many ways. You’ll be hearing more about it in the coming days. A special thank you to our guest speakers who helped make last night extraordinary, especially student speaker Tera Gomez for sharing her inspirational story. Many thanks to all of the volunteers, faculty, staff and guests for your attendance and support. And caps off to the 2015 HSE graduates who took part in the ceremony. Congratulations. You should be very proud of your achievements! We will post high resolution photos you can upload and share in the next few days. You will also have an opportunity to purchase individual photos from GradImages at www.gradimages.com in the next few weeks. You will also have a chance to view the ceremony in its entirety on MCTV. Stay tuned for air dates. It will be well worth your time! 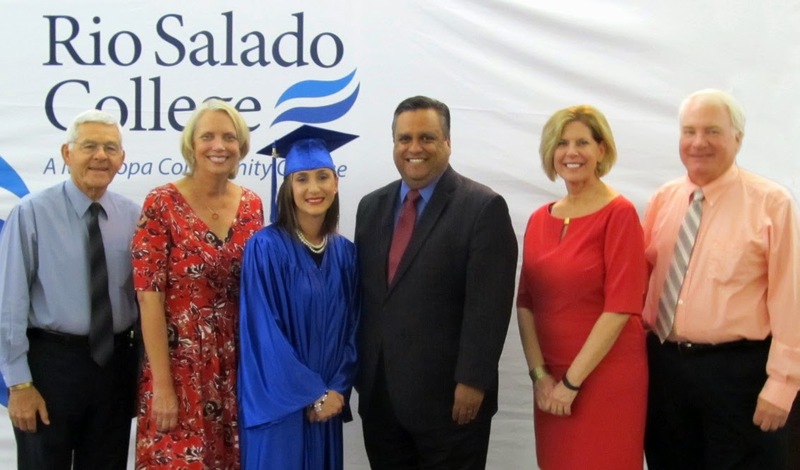 Pictured above: MCCCD Governing Board Member Doyle Burke, Deputy Associate Superintendent of Adult Education Services Sheryl Hart, Tera Gomez, Rio Salado President Chris Bustamante, MCCCD Governing Board President Tracy Livingston and MCCCD Governing Board Member Dana Saar.